What’s a Community Land Trust? Please excuse our appearance while the website is under construction. 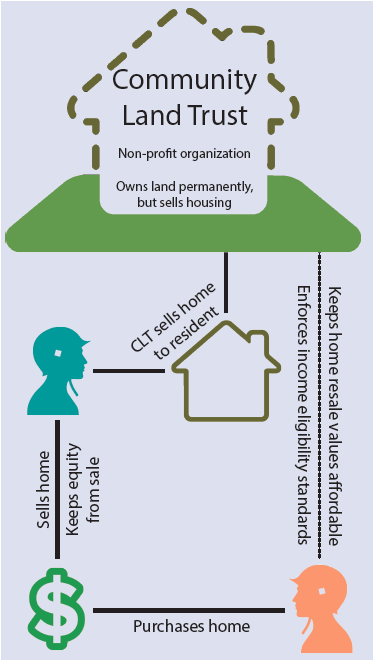 CLTs are nonprofit organizations—governed by a board of CLT residents, community residents and public representatives—that provide lasting community assets and permanently affordable housing opportunities for families and communities. CLTs develop rural and urban agriculture projects, commercial spaces to serve local communities, affordable rental and cooperative housing projects, and conserve land or urban green spaces. However, the heart of their work is the creation homes that remain permanently affordable, providing successful homeownership opportunities for generations of lower income families. What’s the Difference Between a Community Land Trust and Land Bank? How Are Community Land Trusts Formed? Land trusts can be a very dynamic part of a community and its residents. For a full source of resources and tools on how to start one, please visit the Community Land Trust Network. How Do I Become a Member of UCLT? All interested members are invited to our monthly meetings. They are held at the Uniondale High School the second Saturday of every month. Please get in contact with our Membership coordinator, Valerie Anderson at vcampbell@ft.newyorklife.com. For more information, please visit our membership page.